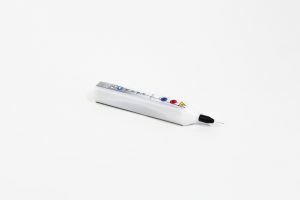 Eternal Youth Clinic is proud to introduce the plasma pen technology to it’s portfolio of available treatments. This latest generation technology produces very small burns to the upper layers of the skin whilst minimising heat trauma to the underlying tissues. This allows us to resurface the upper layers of skin and create significant skin retraction and tightening. It is best used for small scale skin tightening and resurfacing of small well defined areas rather than the whole face. 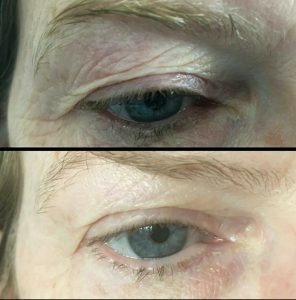 One exciting indication is known as the non-surgical blepharoplasty. As seen above this procedure can produce a significant skin tightening of the upper lids and a marked anti-aging effect on the facial appearance. It has also been used for long lasting improvement of smokers lines on the upper lip and smile lines around the eyes. This is all done with the minimum of down time and risk. 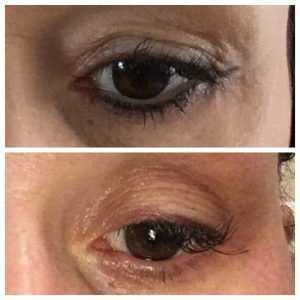 Below is another example of the subtle non-surgical improvements that can be obtained. The device uses radio frequency energy and the process of sublimation to produce small carefully controlled burns on the skin which stimulate collagen reproduction and fibroblast regeneration whilst also causing significant tightening. Much like bacon shrinks in the frying pan the heating process shrinks the skin fibres and reduces visible skin laxity. After photos are taken and anaesthetic cream is applied the skin is given roughly 30 minutes to go significantly numb. Then the cream is removed and small carefully controlled pin point burns are placed in a relatively random pattern to have the desired effect on the skin. These initially look like small brown or black dots. Especially when treating the eyes there can be significant swelling and the Plasma Pen treatment is one of the most marking procedures offered at Eternal Youth Clinic. The small brown/black scabs last at least 7 to 10 days and then they must be allowed to fall off naturally. If you attempt to speed up the process by picking off the scabs there is a significant increased risk of permanent scarring. The eye swelling settles after a few days and when the scabs fall off the underlying new skin is very pink. This can be easily covered up with a mineral make up or camouflage wound dressing such as Lycogel. The pinkness lasts a variable time but eventually the skin returns to normal. By this time you will have noticed fresher healthier skin and reduced skin laxity. 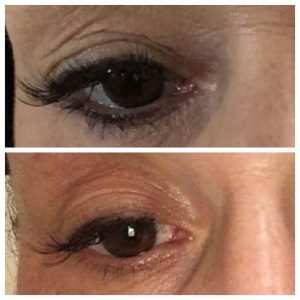 The picture below shows before, immediately after and the improved healthy looking skin around the crows feet later. 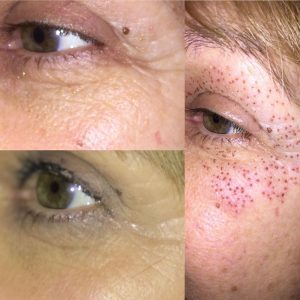 No treatment is without risk and there is the potential for hyper-pigmentation and hypo-pigmentation plus a very slight risk of scarring. There will certainly be significant swelling around the eyes. All these risks will be explained to you in the consultation. If this or any of the other treatments is of interest to you then please call the girls on 01260 226688 and they will arrange for your free consultation to assess your suitability for the treatment and other possible options. Eternal Youth Clinic is very happy to offer the new Plasma Pen treatment to the patients in Congleton, Wilmslow, Alderley Edge, Hale, Altrincham, Sale, Knutsford and the other surroundings of Cheshire.